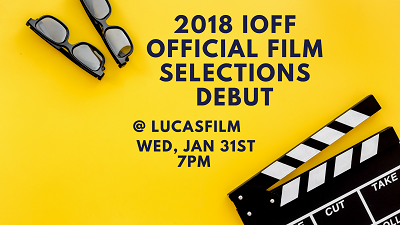 Join us as we launch the 15th Anniversary International Ocean Film Festival (IOFF) official film selections at Lucasfilm, at Letterman Digital and New Media Arts Center in the Presidio! Be a part of the excitement and be among the first to learn about all the upcoming festivities and preview the films. Watch short films and trailers, mingle with local filmmakers and directors, and "meet" the all-star casts including surfers, sharks, orcas, and seabirds on the big screen. Meet the IOFF Screening Committee and volunteers from the festival, all of whom are making this milestone festival possible. You can even learn about volunteer opportunities at the festival. This is a free event, so reserve your seat soon as space is limited! Doors open at 6:30 pm, with general admission seating. Screening begins at 7:00 pm. After the screening, we'll head down to Sessions Restaurant for a post-launch meetup and keep the conversation going!